THEM Anime Reviews 4.0 - School Live! AKA: がっこうぐらし! ; School Life! ; Gakko Gurashi! 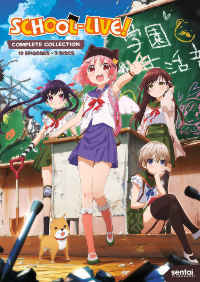 Distributor: Currently licensed to Sentai Filmworks, also available streaming on Crunchyroll. Yuri Wakasa, Kurumi Ebisuzawa, Miki Naoki, and Yuki Takeya are the members of the "School Living Club", which is all about living at their school, of course- because they've got no choice. The question is, how long can they stay safe and maintain the status quo? The idea that Japanese schoolgirls can overcome ANYTHING, including supernatural monsters, may have transcended Japanese pop culture- and if you doubt me, check out the U.S. film Cabin In The Woods. School-Live! tries to combine kawaii and horror with, I feel, mixed results- my main problem is with the character who's the most obvious attempt at kawaii- but the other characters are wonderful, and this show often demonstrates an intelligence, and a consideration of nuance, well beyond what you'd expect in a zombie show; some of these girls are actually pretty sharp. The leader of our "School Living Club" (which is physically confined inside barricades of stacked desks) is Yuuri Wakasa; she's also the bustiest, as will be made plain in the obligatory swimsuit episode. She's a peacemaker who manages by persuasion, but hesitates at making certain hard-hearted "practical" decisions. (This is also true for Kurumi, who we'll meet next; their vacillation will, at various times, prove to be both a curse and a blessing.) I didn't warm that much to Yuuri, maybe because we get less of her background than with the other girls. Kurumi Ebisuzawa was my personal favorite. As far as what we're shown, she's the only one of the girls who had an actual romantic interest before the zombie plague spoiled it. (Zombie plagues spoil EVERYTHING.) Kurumi is the only actual warrior in the group; her weapon of choice is a shovel. (They all tell the delusional Yuki that she's carrying it just for gardening.) She's "point" in all their journeys, and scouts beyond the barricades, a very dangerous business you might think, and you'd be right. The remaining girl, Yuki Takeya, was... not one of my favorites. The one who the show most clearly plays for Kawaii, she basically snapped after a beloved young teacher fell to the zombies, and started living in a fantasy world where the teacher, and all her classmates, are all still alive. Yuuri has not tried to dissuade her of her version of reality, since she's still cheerful (and that raises everyone else's spirits as well), but I'm with Miki on this- as she is, she's a hazard to herself AND the others. Most of the show's maudlin sentimentality attaches to her - and there's a surfeit of that, alas- though to give her her due (and to also be a little snarky), sometimes it's a good thing that no one wants to hang around for long-winded speeches. -Normally zombies don't seem to retain memories of their former lives; maybe here they do. -The girls realize there's something peculiar about their school- it seems suspiciously well-prepared for disaster- and their explorations of this situation prove critical to their survival. Recommended Audience: Mild fanservice (swimsuits), but tense (and later unnerving) zombie attacks and violence. Right Stuf rates this for 14+. I'm OK with that.